Had a hard time figuring out how to blow up the sphere. I was able to tractor the containers and then transfer from them. Is that the way it's supposed to be done or is there something I missed? You have to shoot the powerful EM forcefield. It may not be in your overview, you have to select "all" in your overview settings. If you need to get down to minimal aggro after blowing up generator and hive, just warp back in. Run with a drake. Don't think anything got close enough to actually shoot at me. All hostiles removed before taking out the EM field and hive. Note: the lesser drone hive dropps 2 cargo containers, only one has mission objective. bring 2 tractors if you don't want to risk having to tractor twice. Tried to do it with aggro from only group 2, shot the shield nearly right away from warp in point. Got mass aggro. Tank didn't hold, had to warp out. Will try ThunderClap's blitz next time. ThunderClaps blitz works *much* better. Until you get to the sentry guns you can stand off and snipe everything. Running an armor tank Myr I never got below 46% shields. This is about the 6th time I've gotten the mission in the last month and the first time the force field has blown up on it's own. I killed the last sentry and boom. Completed in Myrmidon. Only sentry guns give loot. Confirmed, Thunderclap's Blitz is MUCH better than the listed one. Don't even bother shooting proxy aggro drones, just burn up to the Lesser Drone Hive, tractor beam the two cans, get your loot and warp out. Easily done with a Harbinger. For those who do not want to blitz - maybe cos u want to salvage all the wrecks. You do not need tractor beams. Attack each ship in turn but not the 3 Towers or the ships next to the Towers. Attacking any ship will not aggro any other ship. You should now have 3 Towers plus 2 or three ships. Take out the towers then take out the remaining ships. Take out the Lesser Drone hive and then the Powerful EM Forcefield. Loot the three cans, one of which will hold the mission objective. Salvage the wrecks - job done. Used a Myrmidon. Took no damage at all - even to my drones - until the 3 Towers were attacked. The shields went but no armour damage. Used one of each type of hardener. Mission changed NPC corp standing by 1.20±0.08 %, probably worth 1.25%. I tried to blitz in other way. 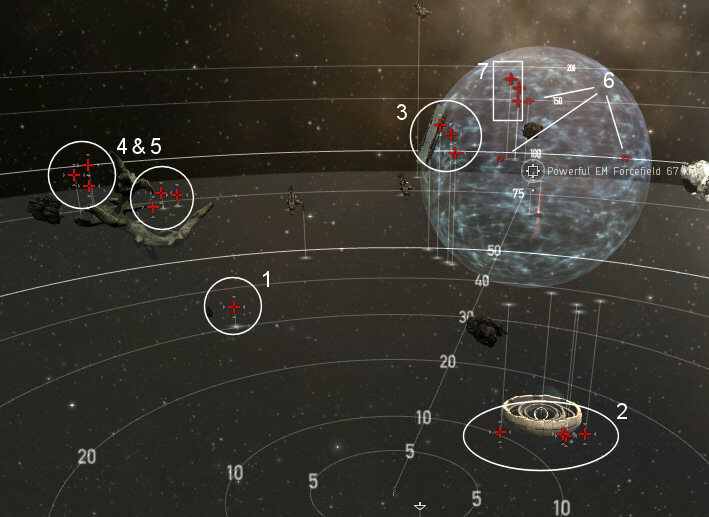 Loot, scoop MTU and warp out. I didn't touch the forcefield. It works.